The largest tourist event of the island is undoubtedly the Sea Week festival that is held in Horta between the first and second Sundays of August. It originated in the reception of the Portsmouth-Horta regatta in 1975 that motivated a large gathering, lasting one whole week and becoming a marking occasion. It seems that all started with the wine from Pico… The foreign sailors and yachtsmen appreciated the renowned hospitality and friendlyness of the people of Faial and so the festival was born, with the enthusiastic will and cooperation of the locals. In a first phase the event was organized by Horta's nautical club and Horta's Regional Commission for tourism, aided by the Horta's port authority. Although the budgets were very limited, the determination was unstoppable and gradually, the feast attracted the attention of regional, national and even international yachtsmen. Multiple cultural and entertainment activities emerged, allowing the festival to proceed with more sponsors and resources. Recently Horta's Municipal Council with the help of official entities took the responsibility of organizing the Sea Week, mainly due to the fact that the religious and street feasts joined the sea competitions. Every year the festival has grown bigger and bigger, not only quantitatively, but also qualitatively. There are more days, more water competitions, more exhibitions throughout the town, more promotion, more decorations, more shows, with artists from the continent and abroad. This is certainly the event that you cannot miss! Following the official opening of the event, a Mass is celebrated in the chapel of Our Lady of Guia, on top of the hill of the same name and the image is then transported by boats in the Nautical Procession, passing through Porto Pim Beach, entering the Horta Harbour and disembarking in the Santa Cruz quay. The image is then carried in procession to the Church of Angústias under the alert gaze of the people with houses along the route, who exhibit their valuable mattresses out of the windows of the upper floors. During the daytime everyone's attention is centered on the numerous nautical competitions that are carried out by the members of the archipelago's nautical clubs, filling the channel with dozens of vessels and their coloured sails. These competitions include in the yacht category the Atlantis Cup and the regattas of the Channel, of the Mermaids, of the Lonely, of the Former Participants and the Horta Trophy; the canoe races Horta-Porto Pim-Horta, Horta-Varadouro, Varadouro-Horta and of the fastest mile; the crossing of the harbour swimming competition; the regional championships in vessels of various sizes; the water games; the dinghy and rubber raft rallies; the pedal races; the Sea Week Tournament; the water polo; the sports fishing; and the whaling canoes sailing and pedaling races. Late in the afternoon the participants get together in the bar of the nautical club for a happy-hour gathering, during which the prizes are awarded. At night the animation returns to firm land the marina fills up and the decorated navy frigate lights up. 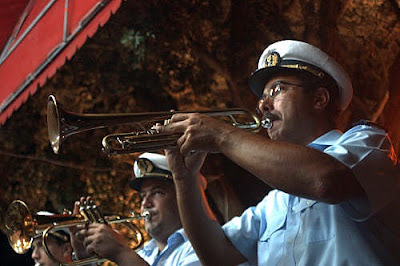 Part of the seaside road is closed to traffic carts of popcorn, stalls owned by gypsies who every year sell the same knickknacks, a church fete and the stall of the local radio station that sells T-shirts are set up; several huts that sell drinks and light snacks are opened in front of the nautical club and in the seaside garden; and that area is filled up with so many people that it is said the island rolls towards that side due to the excess weight…. In the evening, exhibitions and handcraft and book fairs are also opened to the public in the high school compound and the souvenirs and crafts there are cheaper than their usual prices in shops. Until 10:30 p.m. various folkdance groups, bands and pop music groups from all around the Azores perform on the stages of the marina and the Infante Square. This enables all those sitting on the seaside wall watching the crowd walk by to turn round and watch the acts while updating their conversations. By this time the bars of the marina, of Peter Café Sport, of Canto da Doca and the cafés Volga, Internacional, Papapizza, Nevado, Bico Doce and the food stalls are inaccessible due to the great number of tourists and locals that fill them. Please change the Mattresses hanguing from the windows to "valuable bedspreads"